I'm not sure why I woke up so early this morning, but I was up and reading various things on my smartphone and was reminded about today's eclipse of the moon. The eclipse was supposed to start not long after I was reading about it, and thinking that the maximum in my area was going to be at 4:51 am — which is actually when the total phase of the eclipse was going to start — I rushed outside with a headlamp and my phone to see if I'd be able to see it. 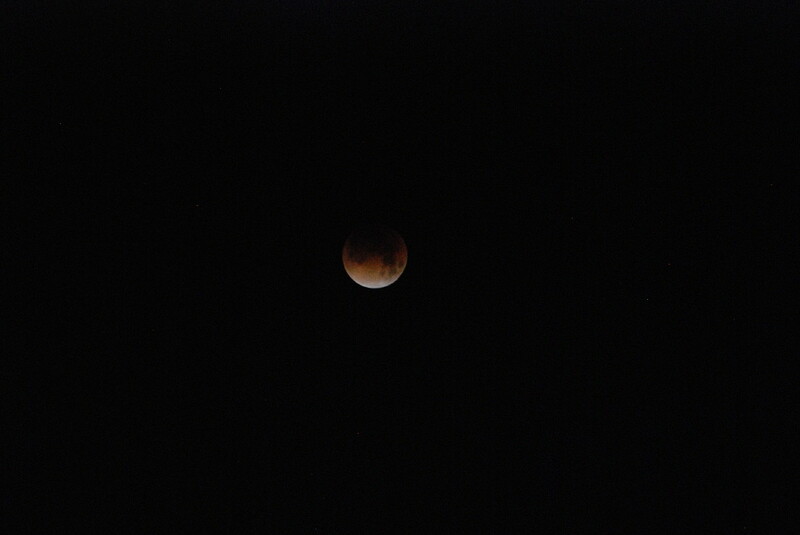 While out there, I got the first photo, above, which is the moon looking like a tiny red ball. The time was 4:49 am. Seeing how spectacular it all looked, I ran back inside and got my Nikon with its 18 to 200 mm lens and grabbed several shots while standing in snow and leaning against the camper in the front yard. 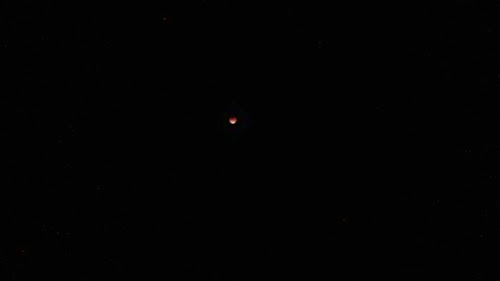 I didn't realize the eclipse would be happening for nearly another two hours, so I took photos only of the early part of the red phase, which is the total eclipse phase. The above photo is how the moon looked, without enhancement, at 5:07 am, about 20 minutes before the maximum stage of the eclipse, at 5:29 am, when the moon was at it's closest to the center of Earth's shadow. Read more here. I went back inside and tried to go back to sleep. Here I've enhanced the photo a little, but a 200 mm zoom doesn't really do that well with moon shots, so you should head on over to Geotripper to see some better photos by Garry Hayes, along with explanations about what the heck the terms "super" "blue" and "blood" refer to when describing a moon.